Today’s episode is brought to you by our sponsors! – Out of the Park Baseball is Ian and Steve’s favorite baseball game and it should be yours, too! OOTP ’17 is just around the corner, arriving March 22 on OOTPDevelopments.com! Use the promo code PHILLIES17 to get 10% off OOTP Baseball ’17! – 100 Greatest Phillies of All Time by Ian Riccaboni – now available on Amazon! With Adam LaRoche retiring, does Ryan Howard make sense as a trade target for the Chicago White Sox? Ian and Steve try to sort out the bullpen. Is it OK to get excited about Andrew Bailey? Which lefty (Bobby LaFromboise, James Russell, Daniel Stumpf) breaks camp with the team? How or why do you know Steve Winwood? Spencer Davis Group? Blind Faith? Traffic? “ROLL WITH IT, BABY!”? No trivia question this week but an essay: What if A-Rod breaks the home run record and says Hank Aaron is the real home run king? Send your answer to Steve@worldofcorino.com! Steve’s son makes a very special appearance! Follow @ianriccaboni, @kingcorino, and @philliesnation! Like and subscribe on iTunes! Join us tomorrow for a special THROWBACK THURSDAY upload. That episode is NOT in “cannon” but features a very special Part 1 of an unedited interview with Phillies’ legend Curt Simmons! Send your questions, comments, and more to @philliesnation, @kingcorino, and @ianriccaboni. Thanks for listening! 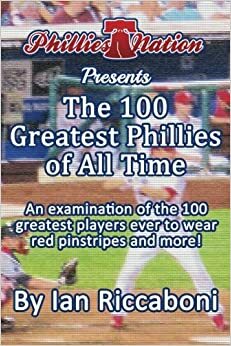 About Ian Riccaboni: Ian has been a Phillies Nation contributor full-time since 2011 and is the author of The 100 Greatest Phillies of All Time. Ian can be seen on Phillies Nation TV, is the voice of Women of Honor, and is a Sports Media professor at Holy Family University. About Steve Corino: Steve is a life-long Phillies fan whose love for the Phillies dates back to the launch of PRISM! Steve is a former ECW World Champion who has 80 tours of Japan. His best friend Mr. Wrestling III can be seen every week calling Ring of Honor action in Philadelphia at 11:30 PM on Saturdays on WMCN 44 and Midnights every Wednesday on COMET.